Polystyrene (PS) and poly(methyl methacrylate) (PMMA) are two of the most widely used synthetic polymers. Polystyrene is used as a protective packaging for anything from foods to cd cases and disposable cutlery, while PMMA is regularly used as a polymeric alternative to glass and even in some medical technologies, and countless other consumer products. In both cases, melting and moulding are regular processes that these polymers must endure. It is, therefore, important to understand how they will respond to this kind of treatment. It is well recognised that the bulk properties of a polymer such as strength, toughness, flexibility, etc. are strongly dependent on molecular properties such as molecular weight and branching. A study was, therefore, undertaken to explore how these polymers respond to the stresses of moulding. This application note describes the molecular and rheological changes that occurred as samples of PS and PMMA were repeatedly extruded through a capillary rheometer, simulating moulding. The capillary rheometer was used to measure changes in melt viscosity, while multi-detector GPC was used to characterize changes in molecular weight and structure in the samples after each cycle through the rheometer. One sample of PS and one of PMMA were extruded through the Malvern RH10 capillary rheometer. The PS sample was run at 200 C and the PMMA sample was run at 230 C. Both samples were run through a shear rate table from 20 to 2000 s-1 for each extrusion process. Each sample was collected and this material was again extruded through the rheometer a total of four times. Thus, for each polymer, five samples were collected of virgin polymer and material which had been processed for up to four cycles through the rheometer. The GPC results for the PS sample on the three detectors show a clear trend with the sample peak eluting slightly later in the chromatogram and giving smaller responses on the LALS and IV chromatograms. The results indicate sample degradation with each cycle through the rheometer and the analysed results show a steady decrease in molecular weight and intrinsic viscosity as the cycles progress. 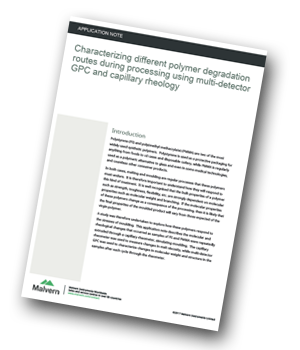 The results presented in this application note demonstrate both utility of using multiple polymer characterization tools to characterize polymer properties, and how different polymers respond quite differently to the same treatment.